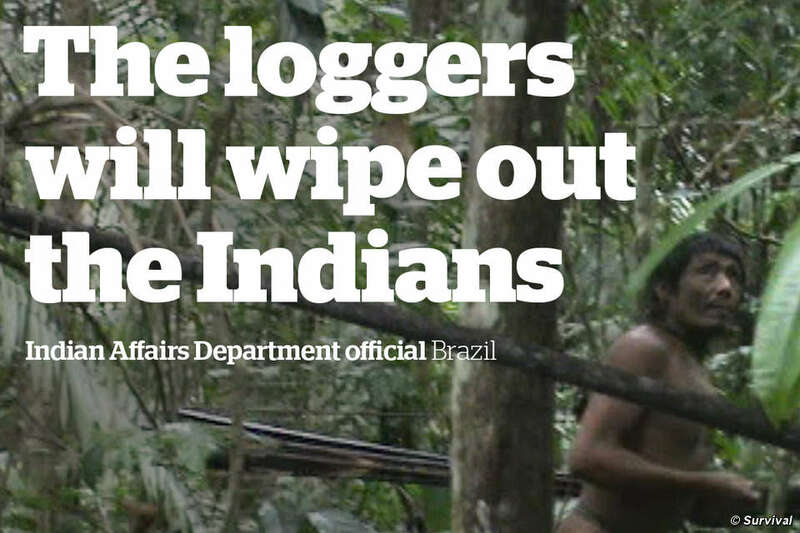 In the Brazilian Amazon, a tiny group of uncontacted Indians teeters on the brink of extinction. Survival’s global campaign is pushing Brazil’s government to protect their land – the only way they can survive. This film, narrated by Mark Rylance, contains unique footage of the Kawahiva filmed by government agents in 2011, during a chance encounter with the Indians. Send an email urging Brazil’s Indigenous Affairs Department FUNAI to physically map out and protect the Kawahiva’s land, to give them a future. The battle for the Kawahiva’s survival is not complicated. On one side, the loggers, ranchers, land speculators and miners intent on stealing their land. On the other, the Kawahiva, and the global movement for tribal peoples’ rights. In the middle: the Brazilian authorities. Only they have the power to ensure the Kawahiva’s land is permanently protected as an indigenous territory. Survival’s successful campaign has resulted in Brazil’s Minister of Justice ordering the mapping out of Kawahiva land. Now we must ensure that FUNAI – Brazil’s Indigenous Affairs Department – does the demarcation and that it provides sufficient funds and field workers to protect the territory properly. This is a fight that, with your help, we can win. In 2014, the ceaseless efforts of Survival’s supporters pushed Brazil into protecting the heartland of the Awá hunter-gatherers, Earth’s most threatened tribe. This situation is no different: With enough pressure, we will succeed again. We need your money, energy and enthusiasm to drive the campaign. Please donate to fund our behind-the-scenes work, and email the authorities, urging them to take action. Read more about the Kawahiva’s lives and lands. Send an email to the President of FUNAI urging him to physically map out and protect the Kawahiva’s land, to give them a future. Donate to Survival so we can continue to educate, research, campaign, lobby and protest against the annihilation of the Kawahiva and other threatened tribes worldwide.